A glass is disordered material like a viscous liquid and behaves mechanically like a solid. A glass is normally formed by supercooling the viscous liquid fast enough to avoid crystallization, and the liquid-glass transition occurs in diverse manners depending on the materials, their history, and the supercooling processes, among other factors. The glass transition in colloids, molecular systems, and polymers is studied worldwide. 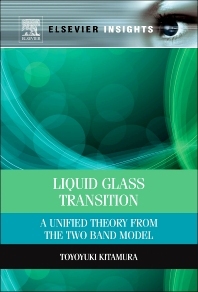 This book presents a unified theory of the liquid-glass transition on the basis of the two band model from statistical quantum field theory associated with the temperature Green’s function method. It is firmly original in its approach and will be of interest to researchers and students specializing in the glass transition across the physical sciences. Researchers, advanced students and professionals in physics, chemical engineering, mechanical engineering, materials science, and applied mathematics.